Born in Sonora, California, to a Native American mother and a European American dad, Sara Billdt grew up in several small towns in the Sierra Foothills. After her parents divorced, she and her father Luther Billdt moved to Phoenix, Oregon, near Medford. "My father sold cars," she says. "We were poor, but we had everything we needed." After high school graduation in 2003, she and her father moved to Eugene, where he has retired. She held a series of food service jobs and began to sing and play guitar on open mic nights at Cafe Paradiso. "My dad played guitar professionally in the 60s and 70s," she notes. More recently, she got into bartending, first at Cowfish Dance Club, and now in her third year at Blairalley Vintage Arcade. "I feel that I've found my place," says Billdt, who also performs on guitar and vocals with local rock band Coyote. "We usually have a show once a month." Late last summer, as she learned of the indigenous peoples' pipeline protest in North Dakota, Billdt was moved to action. 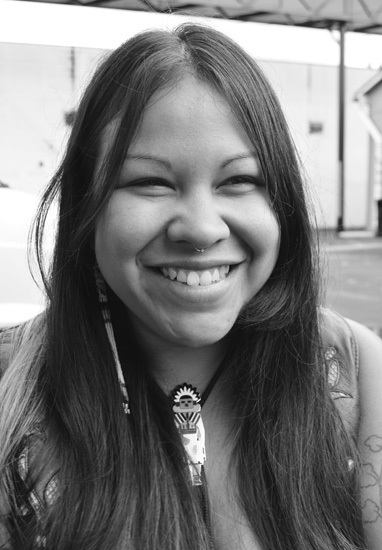 She created the Facebook group Eugene Stands with Standing Rock on September 4th. A week later, she was on the road to North Dakota with two carloads of donated camping gear, along with her new Facebook friend Meesha Goldberg and her 68-year-old mom, Nellie Wooldridge, who had driven up from Sonora. "It was an amazing experience," she says. "I'll never forget the smell of campfire smoke, sage and sweetgrass." Following a fundraiser at Blairalley last weekend, Billdt and Goldberg are planning another supply run to Standing Rock in December. They hope to stay for a month, camping in the cold Dakota winter.